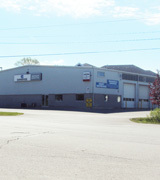 Repair Centre Our repair facility is ultra-modern for the industry. It is specially designed, with four large drive-thru bays that can contain tractor and trailer hooked-up for quick professional service. We employ a night crew who work all night long to minimize our customers' downtime. Our facility also includes a modern comfortable drivers lounge complete with complimentary sparkling clean showers. For a new train dump side roll replacement, drop the trailers in the afternoon after the last load. It is ready to pick-up for 7 a.m. start... with not one lost load! There are no excuses or delays... call Cambridge Canvas to book the repair!